Arvind's World: A visit to Urumqi - China's own wild west ! A visit to Urumqi - China's own wild west ! I visited Urumqi (China) in July 2011 for about 4 days. Till such time my program was finalised, I knew very little about Urumqi. And it turned out to be one of the most memorable visits for me. I do intend to take a month off at some point of time and explore Xinjiang province to quench my curosity of the 'silk route' and how life would have during that period. 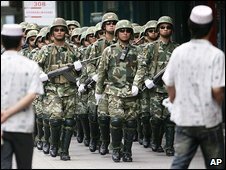 Most of us remember Urumqi in Xinjiang province as the place w here rioting and police action in July 2009 left about 186 dead and thousands injured in ethinc clashes between Han and Uyghurs Chinese. It was described as the worst crises in China since the formation of New China in 1949. Well, I finally got a chance to visit Urumqi, the capital city of Xinjaing Province from July 12-14, 2011. It was my very first visit to China and there couldnt have been a better start to China than Urumqi. The full name of Xinjiang province is 'Xinjiang Uyghur autonomous region' known as 'Xi Yu' meaning the most western land. Xinjiang means 'new distinct land'. Covering an area of 1.66 kms., Xinjiang province occupies 1/6th of Chinese territory and is the largest province in the China, bordering with eight countries - Mangolia, Russia, Kazakhstan, Kirgizstan, Tajikistan, Afganistan, Pakistan and India, covering a boundary of 5,600 KM. Xinjiang provides the only access to the second Eurasian landrail. Xinjiang is confluence of rich history, culture and geopgraphy. There are a total of 570 rivers and over 100 lakes. The glacier reserve represents 50% of Chinese total glacier reserve and the estimated water reserve ranks 4th in the country. At least 138 numbers of minerals have been discovered in Xinjiang province. Locally Xinjiang is known to have 'treasure on every mineral oil in every basin'. The northern part of Xinjiang province is 'Altay' means place producing gold and it is said that there are 72 ditches in Altay Mountain and every ditch has gold. Xinjiang province has 30% of Chinese oil reserve of 34% of natural gas reserve. The common saying in China goes "One will not realize how rich China is until one goes to Xinjiang"; " One will not comprehend how remarkable nature is until one visits Xinjiang". There are more than 4,000 varities of wild animals and plants in Xinjiang. One of the unique and mysterious features of Xinjiang is the presence of Caucasian with blue eyes and blond hair. The capital of Xinjiang province is Urumqi. Urumqi city is the farthest from all oceans and seas in the world. Local residents of Urumqi consist of 53 ethnic nationalities.There are some very interesting places in Xinjiang province. "The Ghost Town" of Orkhu near Karamay is found by Yardan and whenever the sand blows with strong wind, the entire town is covered with sand and dust and strange sounds are made by the wind echo in the air resembling of crying and yelling of monsters. Karamay means 'black oil town' Uyghur language and is the centre in China and also called as 'bright pearl of China'. Lying on the eastern part of Xinjiang province is Turpan which means a fertile and rich land. Turpan was strategic junction on the ancient silk route and is considered to be a living fossil of Chinese civilization. It is the birth place of the famous 'Idikhut' music and dance. 'Karni Irrigation System' in Turpan basin is regarded as one of the three great ancient architect wonders. There are about thousands such Karni Irrigation System, totaling a length of 4,000 KM. Half of Turpin basin is below the sea level and the lowest point there is 154 below the sea level. Turpan is also the fire land on earth with highest temperature ever recorded on earth which was more than 50 degree celsius. Changji Hui, lying on the northern part of Xinjiang province is the centre for Hui people. This is the place where fossils of dinosaurs have been found. It also had a national nature reserve Karan and has got the famous heavenly lake. The other very interesting places in Xinjiang province include Kashgar on the south western side of Kezilesu lying in the city of the Xinjiang province, Akasu lying on the south of Xinjiang province, Hami to the north of Xinjiang, Hotan, Ili and Altay to the north of Xinjiang. Nice. I am reading this much later than you wrote (for very complicated reasons), but I read it just as I finished reading William Darlymple's "In Xanadu". His recollections as he passes through Pakistan and through the (then) newly opened Karakoram highway into Kashgar is certainly worth reading, if you have already not read them. I hope I can visit Xinjiang and spend a few days traveling in that region. I had an opportunity to try food from the region when I was in Beijing - had what they described as Uyghur Kebabs. Very tasty!